2/8 Week AIT training Special Weapons , Ft Sill Oklahoma. After AIT training Mike was sent to 2/18 Artillery in Germany where he drove the M-110 Howitzer 17 months. Ft Lewis when the unit came to USA 1964. 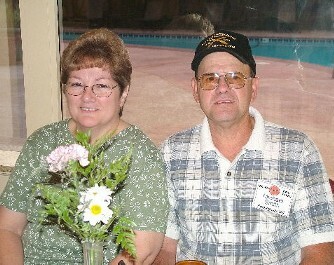 I met Mike on July 4, 1964 as we trained on towed howitzers. Mike Smith became our Barber for our Btry. Mike did not go to Vietnam with 3/18 Battalion. Mike and his Wife live in Rockingham North Carolina. He was our Btry Barber. He knew every song by Roger Miller... oh yes, he sang them to us daily. Mike sang King of the road at Ft. Sill reunion in 2004 he told the crowd he'd gave hair cuts for 25cents... but as he took off his cap he told everyone, "I am bald, now these haircut's are 75 Cents." 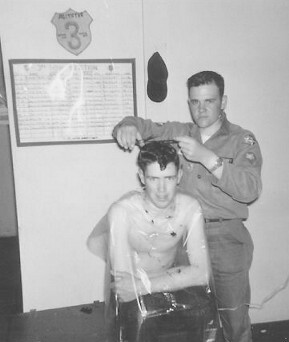 I like this photo of me and Mike, he used a piece plastic to cover you as you got a hair cut. One song I loved, as Mike walked up down hall, he would sing RA all the way and his service number.